Do you like Italian pastries? If you do, you will love these Zeppole di San Giuseppe. Who can resist a traditional Neapolitan pastry, piped with Italian pastry cream? 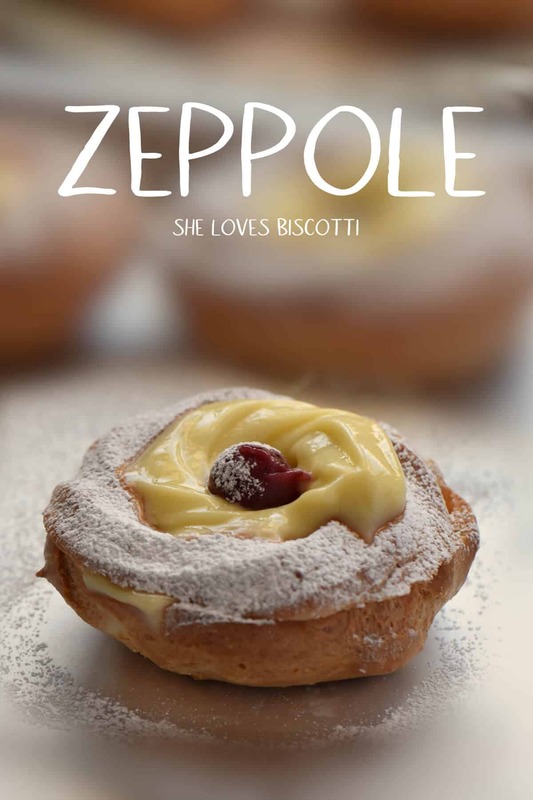 Tips and tricks included to make the best zeppole recipe! This post was originally published on March 18, 2015 and updated on March 15, 2019 with updated content and photos. As with most cultures, Italians have their share of celebrations. And where there is cause to celebrate, there is always food. Take, for example, March 19th. For the average North American, it’s the day before spring. In my world it meant Zeppole di San Giuseppe. Only as an adult did I truly appreciate how food, tradition and culture form some sort of “triforce”. Family gatherings were centered around a celebration that always included food. Some celebrations were obvious (like Christmas and Easter), but some might be unknown to many North Americans. March 19th, for example, is a day to celebrate Saint Joseph, protector of the family and father of all fathers. In Italy, it is also Father’s Day. 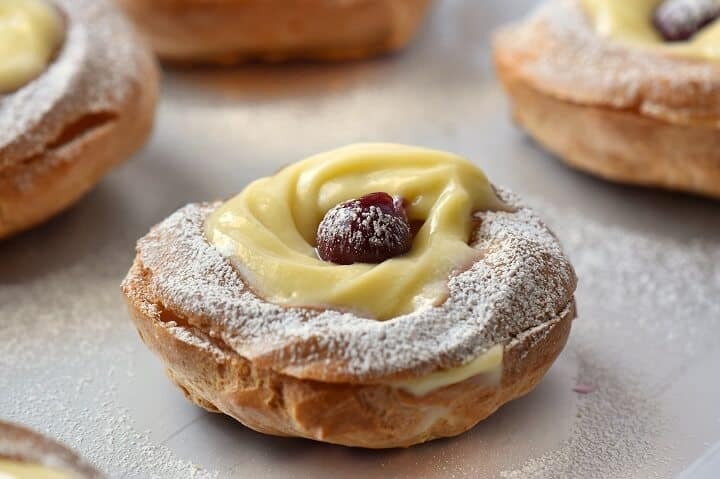 Saint Joseph’s day celebrations always include St. Joseph’s Spaghetti and this sweet Neapolitan treat, hence the name, Zeppole di San Giuseppe or Saint Joseph’s Zeppole. Zeppole can also be referred to as bignè di San Giuseppe. Did you know that March 19th is also the name day to honor anyone named Giuseppe (Joseph)? Another reason to celebrate! A few weeks before March 19th, Italian pastry shops here in Montreal, will begin to mass produce the extremely popular zeppole. Around the dinner table, family and friends start arguing (in a nice way) about who makes the best Italian zeppole, and which is the better filling: ricotta or pastry cream. The original Neapolitan treat was made with a lemon infused pastry cream piped over a fried (in lard – gasp!) shell, and topped with an amarena (which is basically a sour cherry in a sweet syrup). Nowadays, a variety of fillings are offered, one of my favorites is Italian . Thankfully, a healthier, baked version of the shell is also available. I will share with you my attempt to honor the tradition of Zeppole di San Giuseppe by making the Neapolitan version of this dessert – minus the part about frying in lard -no way that was happening! I baked mine. 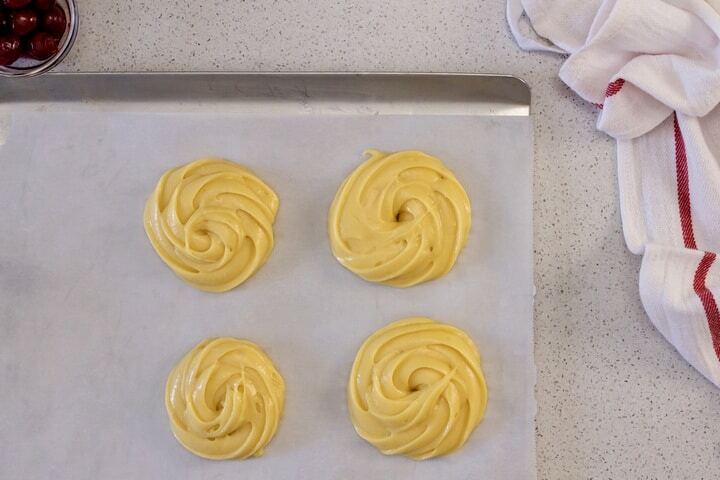 As you may have guessed, Zeppole di San Giuseppe is the product of two recipes –pate a choux and pastry cream. 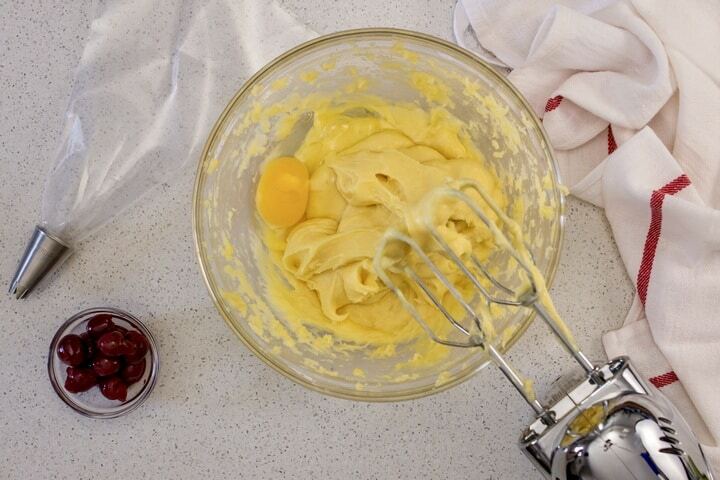 Let’s begin with the choux pastry recipe. 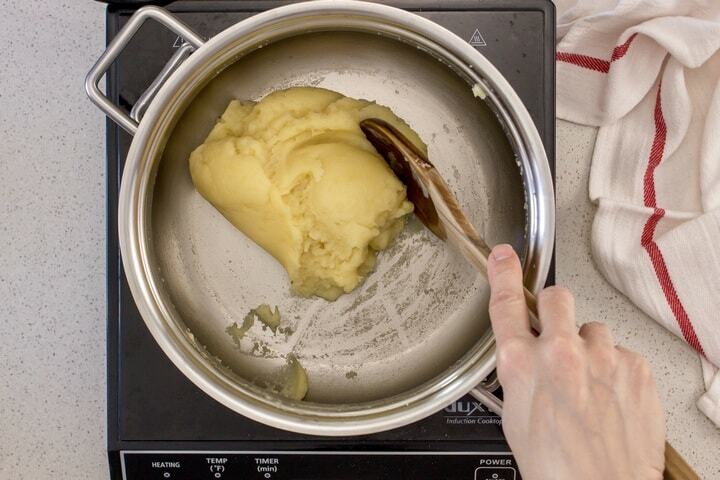 In a large heavy saucepan, over medium-high heat, bring the water and butter to a rolling boil. Immediately, remove the saucepan from the heat and add the dry ingredients (flour, salt and sugar) all at once. In order to avoid lumps, stir vigorously with a wooden spoon to combine the ingredients. Return the saucepan to the stove. Reduce the heat to medium low and stir continuously until mixture forms a smooth ball and leaves the sides of the pan. There should also be a thin film of dough that forms at the bottom of the pan as an indicator of when the liquid has been absorbed properly. Transfer mixture to the bowl of your stand mixture (if using) or in a large mixing bowl. Allow the mixture to cool down for about 5 minutes. 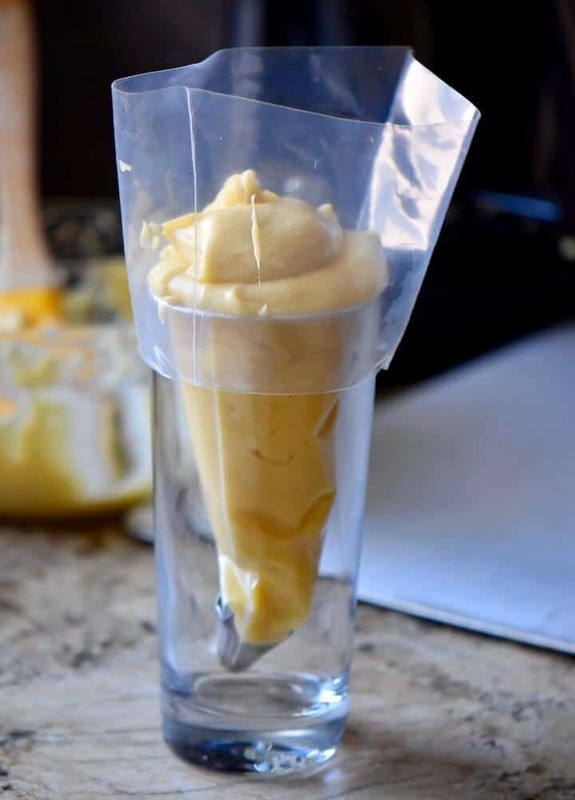 With the paddle attachment or hand held blender (or the old fashioned way with a wooden spoon) beat the mixture for a few minutes in order for it to cool down. The next step involves adding the eggs, one at a time. Make sure to properly incorporate each egg before adding the next one. 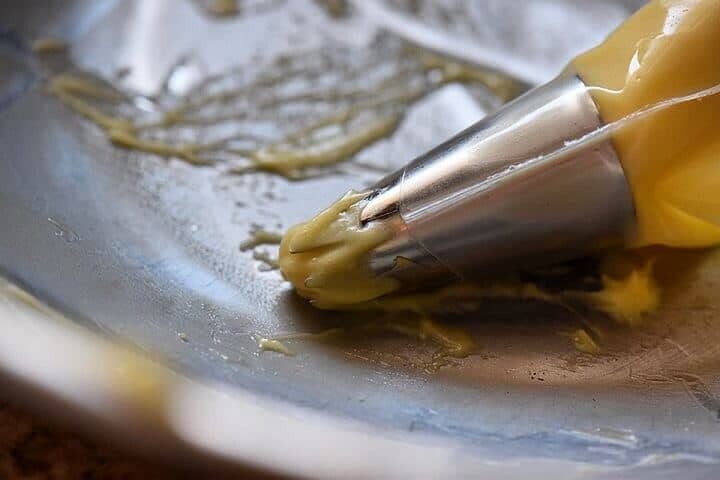 Notice how the batter becomes very smooth and satiny in appearance. So, once again, really beat those eggs! Ideally, you should pipe little nests that are about 2” in diameter. You can also shape the cream puffs by using two large spoons. Scoop out the dough with one spoon, and use the second spoon to push the dough off the spoon and onto the parchment paper. Whether piping or using two spoons, make sure to leave a few inches between each choux as the baked zeppole shell will expand. Bake the cream puff dough in a preheated oven. DO NOT open the door while they are baking as a sudden change in temperature will prevent them from expanding. During the last 5 minutes of baking, pierce the outer shell with a sharp knife. This will allow the moisture to escape. Also, leave the oven door ajar. When the cream puffs turn a nice golden color and have a dry, crisp shell, they are done. Once they have cooled off fill them up with some wonderful pastry cream. The recipe for Lemon Pastry Cream can be found by just clicking on the link. Top with a sour cherry and dust with icing sugar. Enjoy! The neighborhood I grew up in had a wonderful pastry shop that specialized in zeppole, and so this was a yearly treat for us. I thought it would be fun to make a homemade baked zeppole version of this recipe . 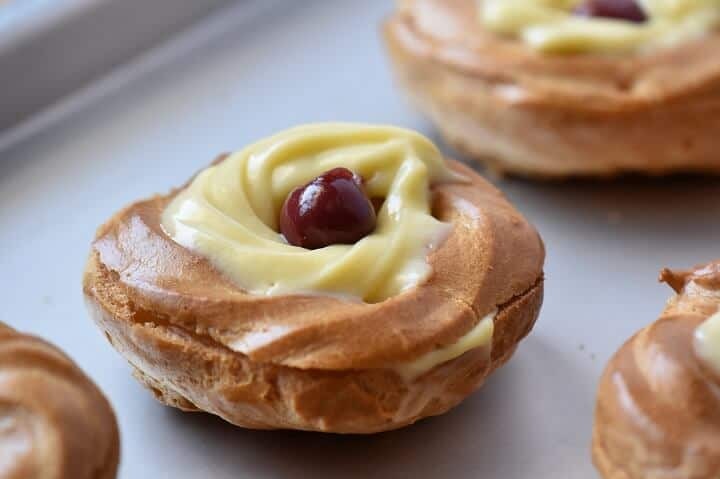 ★★★★★ If you have made this St Joseph Day Pastry, I would love to hear about it in the comments below and be sure to rate the recipe! 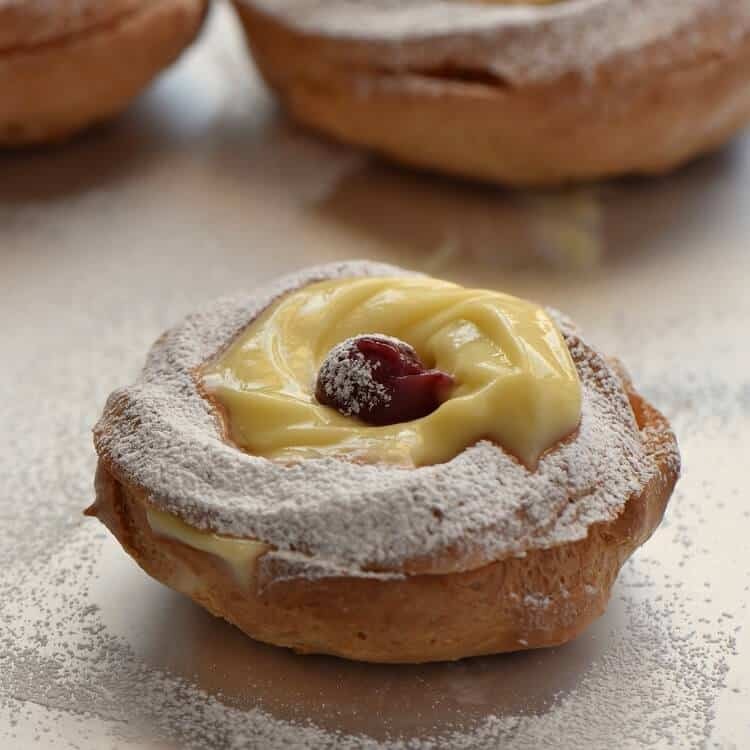 You must have a Zeppole di San Giuseppe on March 19th; a Neapolitan pastry filled with a lemon pastry cream and topped with a sour cherry. Preheat oven to 400℉. Place rack in the center of oven. Whisk together flour, salt and sugar. Set aside. 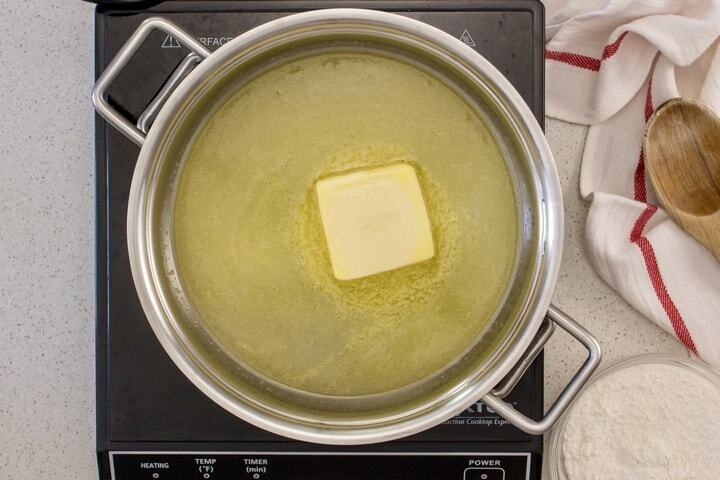 In a large heavy saucepan, over medium high heat, combine water and butter. Bring to a boil. Add flour mixture all at once, and stir with wooden spoon. Return saucepan to the stove and continue to stir until mixture forms a smooth ball (1-2 minutes). Transfer mixture to the bowl of stand mixer or large mixing bowl. Let cool for about 2 minutes. Beat with paddle attachment or hand held mixture for a few minutes in order to cool down the mixture (1-2 minutes). Spoon dough into pastry bag fitted with open star tip. Pipe dough into 2" nests on parchment paper. Place in pre-heated oven for 35-40 minutes, until golden brown. During last 5 minutes of baking, pierce the outer shell with a sharp knife allowing the steam to escape. Leave the oven door ajar. Remove the pastry shells from the oven. Can cut in half or leave as is. When shells are cool, use pastry bag fitted open star tip to pipe pastry cream onto the shells; cover with the top and pipe another tablespoon or so over the top OR make a small hole and pipe pastry cream directly in the cavity; top with more pastry cream. Top with an amarena (cherry) and a dusting of icing sugar. Would you please post the recipe for the filling. When I made them I used ricotta filling. Not as good as pastry cream. Thanks Mary. You can find it in the recipe index…just look for Pastry cream. Just in case you can’t find it, here is the link: Lemon Pastry Cream Thanks so much for stopping by. I just made these Zeppole and the recipe is very easy. The only problem I had was the amount of time to cook them. I tried the first batch following the directions and the bottom got a bit to dark. Not sure if I did anything incorrect. The 2nd batch I made, I cut the time to 20 minutes and opened the door 5 min and they came out perfect. Wonderful Christina. I don’t think you did anything wrong… I think there is a lot of variability with ovens. Glad the second batch turned out great. Thanks so much for stopping by. Ciao Maria! I made zeppole as well yesterday, and today I’m sharing them on our site 😉 . It is such a beautiful sweet, it deserves to be made popular in North America! Yours look amazing, enjoy them with your family and Buona festa del papà!